Wandering around the net I came upon this site selling thread. I couldn't resist buying some even though it works out quite expensive, because I have more balls than I can ever use! Still, the first box turned up last week. In the package was also some Cartier Bresson fil au fouet size 60. 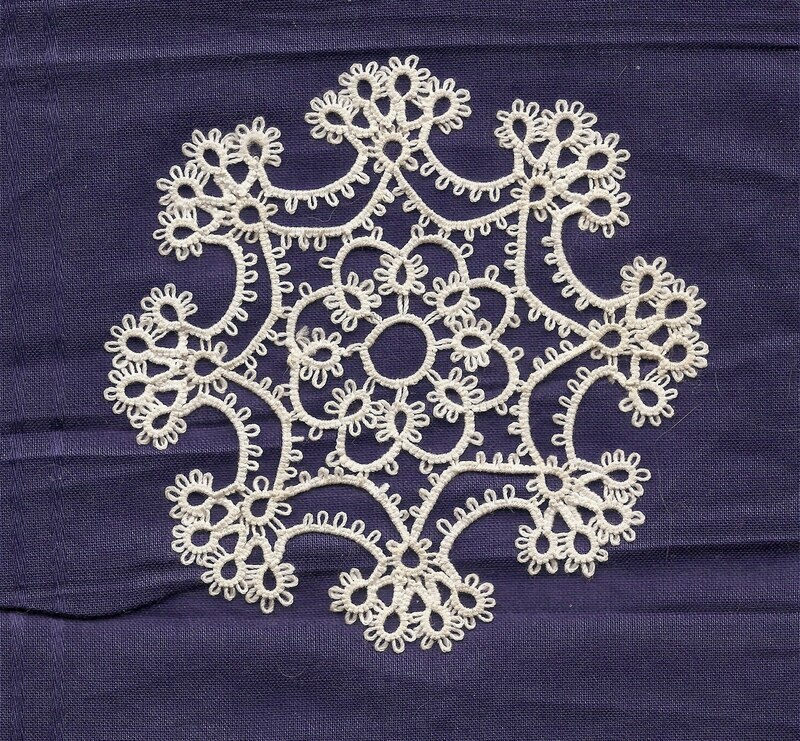 I don't think it is such a good tatting thread, but to be sure I began a doiley with it. 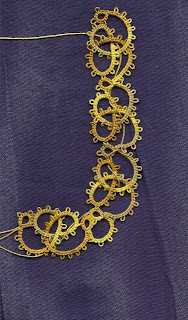 Here are the first three rounds of "Oeillets" from one of my french tatting books. I am also making the celtic edging from Rozella Linden's book, but have stopped for the moment, as I need to join a new thread.... Here it is from a photo I took last week, but I have got a bit further now. 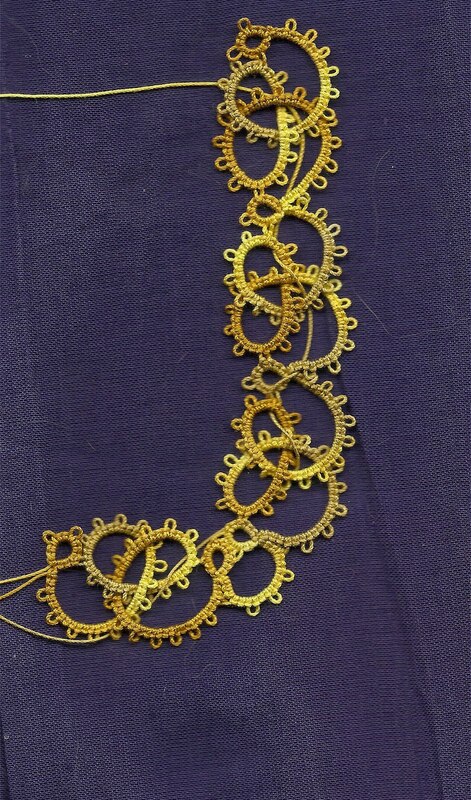 The thread is "Golden Glow" and was a present from Lace-making librarian. I feel that the combination gives the impression of a gilt picture frame, no? That's a beautiful shade of blue! My friend Denise and I went together and bought some size 70 thread years ago... we each still have our boxes! Now that I've started tatting with the finer thread, I'll have to find where I hid it. 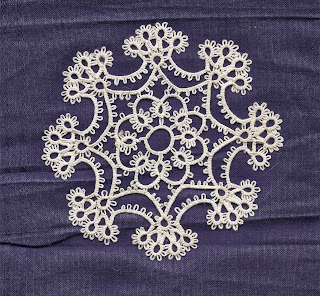 The doily is beautiful! Are the French patterns easy to follow for English-only people like me? I have a couple of Japanese books that are starting to make sense to me. So maybe some French patterns are in my future! Yes, indeed... that thread does look like a gilt frame. That's a lovely use for that thread! I'm glad you're enjoying it! P.S. - I hope your brother is able to get your shuttles for you! Yes, indeed it does! Very pretty. I am looking forward to seeing what else you do with that thread! The forget me not thread - looks like periwinkle - is a lovely colour. Your tatting is impeccable, as always! Thank you Fox and Diane. The French patterns are diagrammed, I think they would be fairly easy to follow.